Second post coming in two days - that is a miracle (and the pace will most probably not last), but I just wanted to share you something I have been planning for a while and finally just got finished! It has nothing to do with weddings even the title may so suggest (there are no summer weddings for us this year, unfortunately), but it is all about my usual felted bag with a little twist. 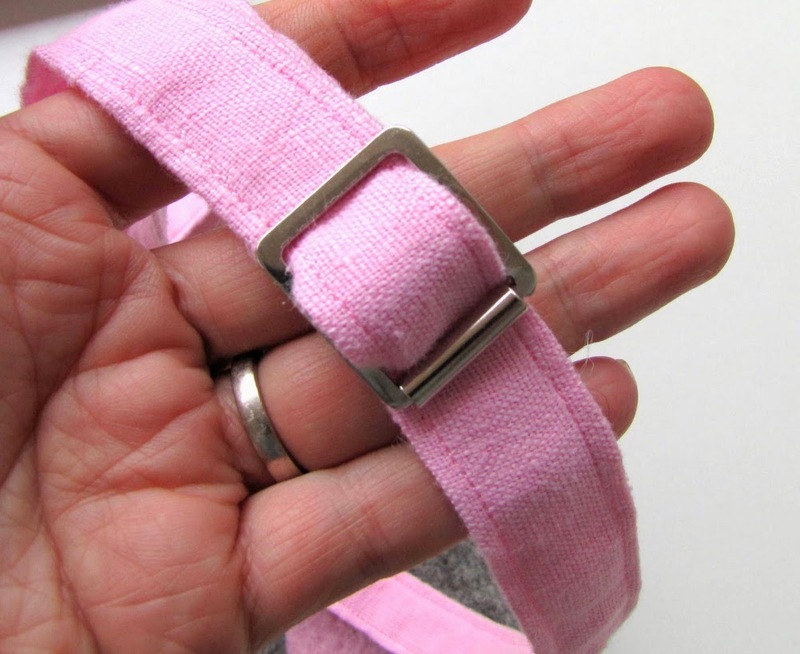 an adjustable fabric strap! It can be shortened for a shoulderbag-use, or when it is on its longest, the bag goes crossbody even if you are really tall taller like me! 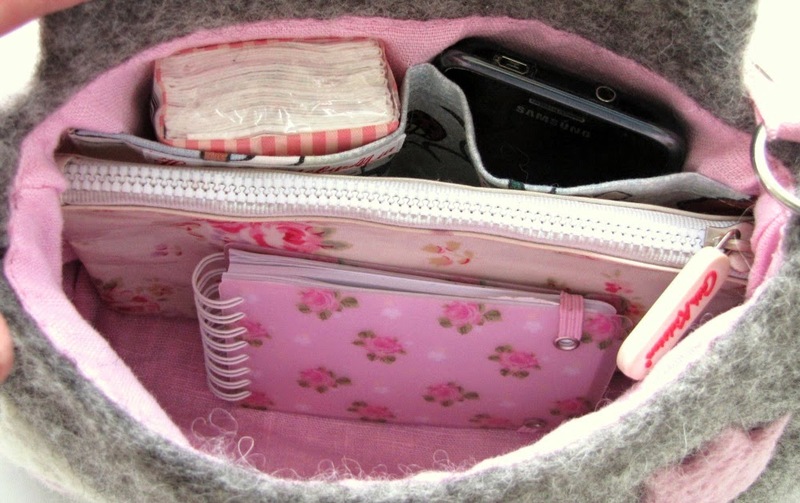 I used pink (matches the kitty's nose&birdie&flower) linen to make the strap, and I also used it to line the bag (with a little kitty-fabric naturally) too for some practical pockets for the must-carry-items. More of these on their way (no surprises there), and once finished, they can be found here. P.S. Still gray&rain-ish here, so if you have extra sunshine, please send this way asap. Thank you! Has that sunshine I sent not arrived yet? Ok sending some more! PS. I have send to you 10 + degrees and looooots of sunshine! I hope you receive them soon! Hi Mia, thanks for updating! 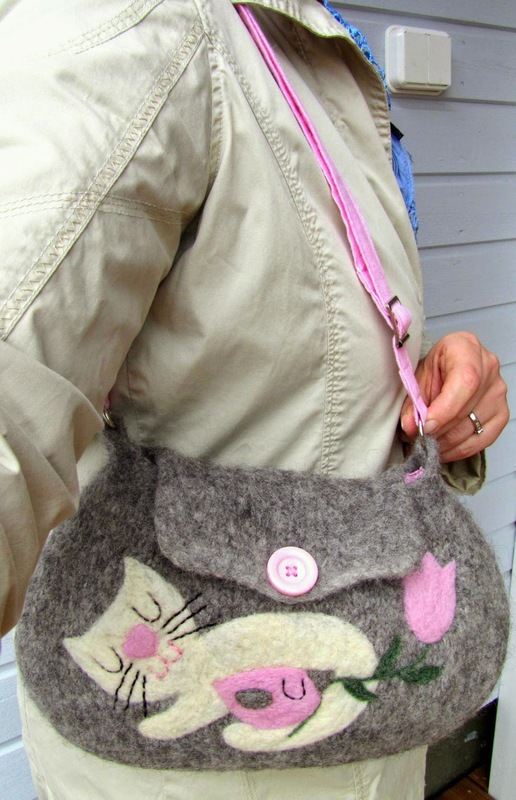 Beautiful purse, I loved the cat and the bird! And I liked the pink strap, too. Here in Brazil we are still having World Soccer Cup, my father, who is retired, is watching almost all of the matchs and marking their results. Now we are in Winter but we have sun enough to send to you. So cute and I love the pink and grey together! Thank you! 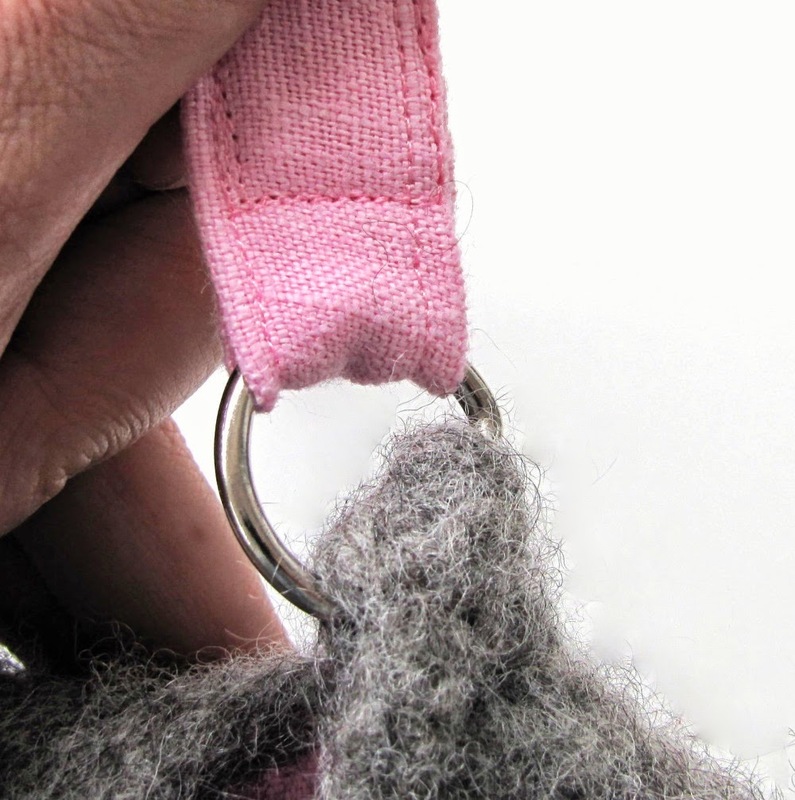 Gray&pink is on of my favorite combos too, they just work together always! And your outfit from lukio sounds great, mine at 89-92 were far less glamorous, blazers and over knee boots and such, huh! I wish the sunshine you sent gets here by tomorrow morning! Thank you! Oh, seaside with those lovely persons sound great, I wish I was there too! Wishing you sunny July! We are till intensively (well my hb at least) following the games too (Belgium - USA on background as I type! ), and I can believe it is HUGE at yours! I wish you (Brazil) will win!! Thank you! 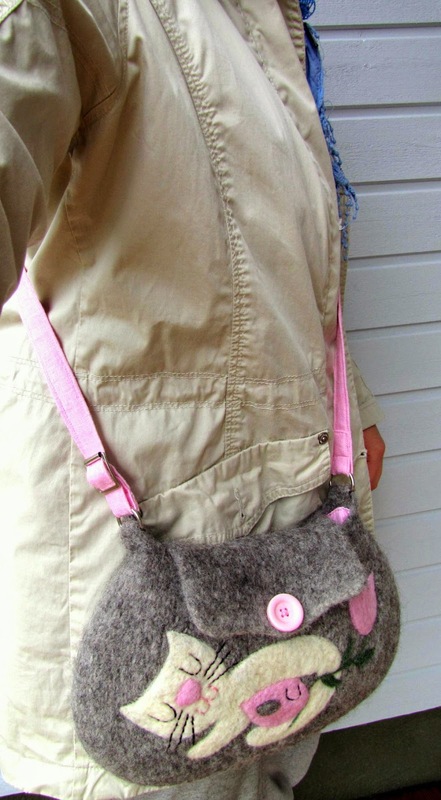 And this bag-strap idea came me a while ago when I was browsing through my older pictures and I saw the bag I made you some years ago - it had similar solution for a strap! 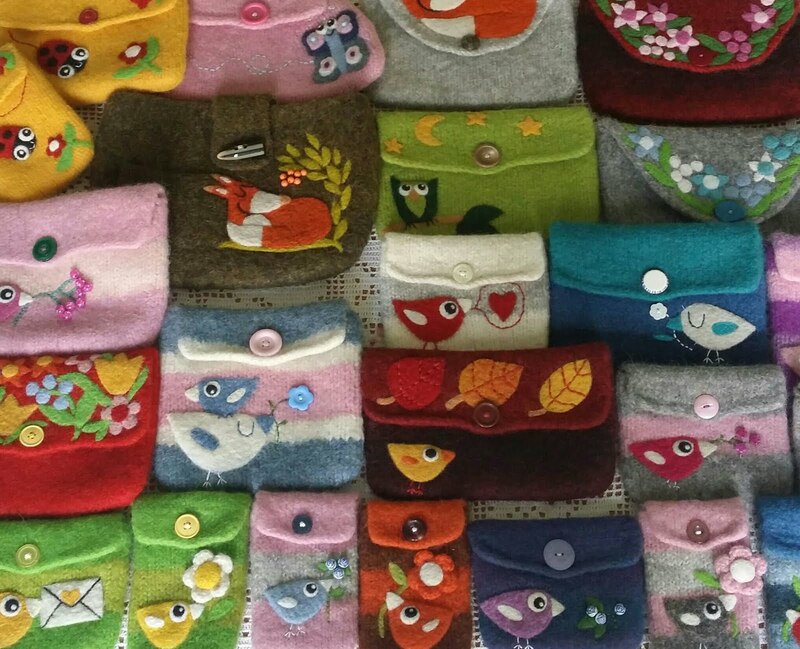 I wish your days are sunny and pretty, happy sewing! Tosi ihana! Juuri sopiva koko ja ulkonäkö sinulle tyypillisen kaunis! Kissat on lähellä sydäntäni (ihan niinkuin sinulla! ), ja kun ei meillä ole kissaa tällä hetkellä, ilmestyy näitä kisuja laukkuihin ja pussukoihin! Ihanaa heinäkuuta, toivottavasti teillä on parmpi keli&lämpimämpää kuin täällä! Thank you! 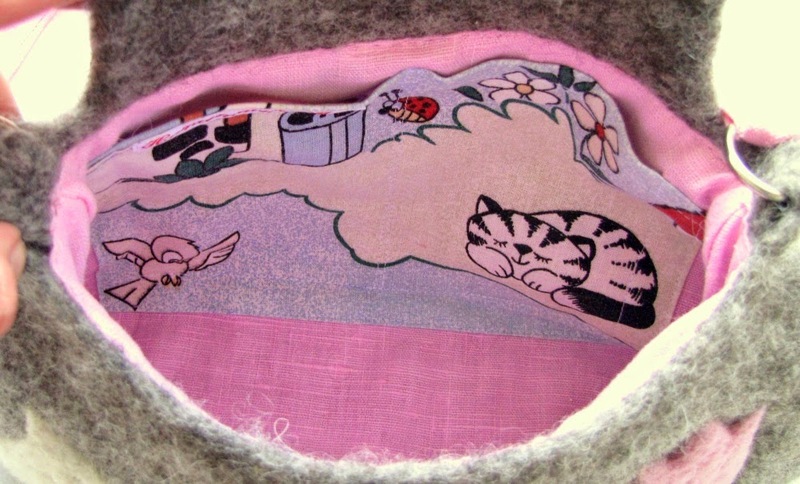 I just had ;) to use pink inside too, it matched the little pink nose quite perfectly! Hi Mia, I love the contrast of the fabric and the wool. Great job!! World Cup is on our TV often. Hope you can enjoy the new deck/patio. I like your cat all the time (so I have bought some of them). They are very sweet. I think the adjustable strap would be handy for smaller kids. We have wonderful weather here, and I am just off to patio to work! The weatherguy promised :) that this will last at least a week - what a bliss! Thank you! Cats are my all time favorites too, and they keep appearing my work quite regularly. 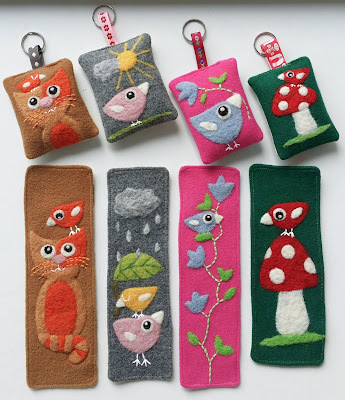 The adjustable strap is quite handy, I wish, and gets felted bags more use during hot summer days (like we have here today, yippee!) too! I wish you had the loveliest time! And unfortunately ;) I can't send you any rain as WE DON'T HAVE ANY!!! It is sunny, hot and beautiful - I'm loving it! Wishing you a lovely July!